Becoming an OfficePOD user can bring benefits to all. The ability to cut down on commuting and spend more time at home, yet be more productive in your office, safe from day-to-day distractions. And as employers increasingly look to flexible working and innovative ways of finding efficiencies without sacrificing productivity, OfficePOD offers an employer a truly flexible workplace solution that doesn't risk compromising the employee's welfare and productivity. Similarly, the employee needn't risk compromising the balance of their domestic environment. All elements of the design and construction make this a highly efficient and functional environment where all available space inside the POD, as well as the ground it occupies, is used to its absolute optimum. A Garden studio offers many advantages over the conventional conversion of an existing room within a house. Not least excellent use of space and a more natural setting for your studio. Be it a computer room, sound studio etc.. the fact that it is away from main dwelling can also ensure you are not disturbing other family members if your penchant is for listening to Motorhead at ear splitting volumes! 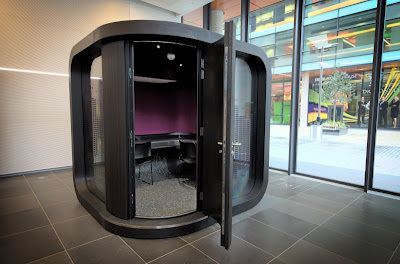 The Pod can be specified with a range of options and be designed to be seated indoors or outdoors and heated ,cooled or ventilated to suit the requirements. 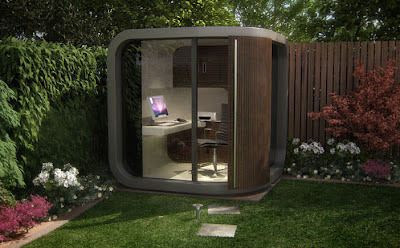 Used in conjunction with some of Think’s space saving ideas the Office Pod is a really useful addition to the modern home/garden environment. 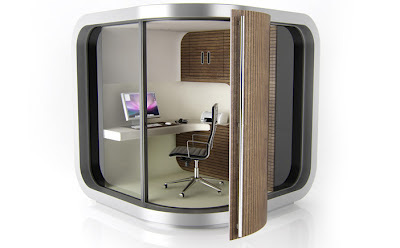 For more information on the officepod please call us on 0870 103 777 or visit our website.